Last month I shared some of my favorite kids' books about going outside. Now it's our turn. There are plenty of "how to take your kid outside" books and, for the most part, I'm not so interested in them. I think taking kids outside is pretty simple: go outside and follow your kids. So I don't spend a lot of time reading about the subject. There are some gems out there and here they are in no particular order. We have to start with the mother of it all: Rachel Carson. If you haven't read Silent Spring, go read it. Or maybe start with this one, The Sense of Wonder. I love her perspective about time, wonder, the relationship between adult and child, and the simplicity of it all. This is a quiet book that is really powerful if you really listen. Going with the "wonder" theme, this book, Companions in Wonder, is a recent find and I'm really enjoying it. They are essays from a wide range of authors about the connection between adults, children and nature. My favorite so far is an essay by Michael Branch about gardening with his daughter. I had to put the book down a few times because I was laughing so hard. It's hard to read when you laugh! He wrote an essay in Orion about story telling that is also one of my favorites ever... highly recommend it too. Another interesting essay in this collection is by Carolyn Kinney who teaches at UC Berkeley. She writes about Barack Obama's daughters and their relationship with nature while living in the White House. That one really made me think. 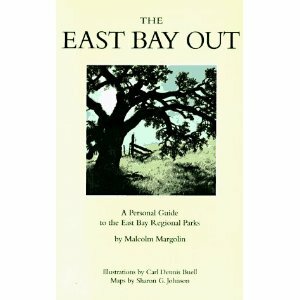 The East Bay Out provides a detailed, but not too detailed, tour of the East Bay Regional Park District. If you've come to an Outside Kids walk, you would like this book. It provides some information about the each park's history, geology, and other interesting tidbits. It was published in 1974 and then again in 1988 and so there isn't a trace of the internet anywhere in the book - to get more information about a park you have to call them! How strange. 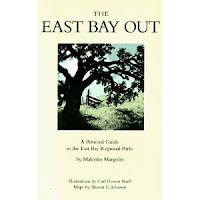 The author, Malcolm Margolin, is a Bay Area legend and the publisher at Heyday Publishing. If you get a chance to hear him speak, go. It will be thoroughly entertaining. I love The Country in the City. I read it all the time. It's the story of why the Bay Area is why it is. How did we get to be one of the greenest - maybe the greenest? - metropolitan regions in the country? How is it that Marin has so many parks and open space? It's a fascinating look at our home and how it got to be as special as it is. It's easy to read and really engaging - don't be turned off by the idea of a history book. The author, Richard Walker, recently retired from teaching at UC Berkeley and is another great speaker if you get the opportunity. I just started this and so I don't have much to say about it yet. But I'm liking it enough to include here. Closer to the Ground is written by a father and it's about his family's connection to nature. I'm really enjoying a man's perspective on raising kids with a strong environmental ethic. Next time we're outside together and the kids are swinging sticks around or finding ladybugs, let's talk about this book. I'll know more then than I do now.